It’s always so interesting to learn how cuisines have been influenced by different cultures and distant places. Cross-cultural effects on food is the focus of Between Harlem and Heaven: Afro-Asian-American Cooking for Big Nights, Weeknights, and Every Day of which I received a review copy. These recipes are from two Harlem restaurants where Alexander Smalls and JJ Johnson created menus with an Afro-Asian-American flavor profile. Because of forced migration, peoples of Africa brought seeds and farming and cooking techniques to many parts of the world. This book explains culinary connections between faraway places such as the mix of cumin, coriander, and pink peppercorns from Ghana that was taken to Puerto Rico and then to the US. And, there’s Roti flatbread found in Trinidad, Suriname, South Africa, Singapore, Sri Lanka, and Malaysia. The book also offers a very modern collection of recipes with bold, fabulous flavors and lots of dishes I want to taste. For instance, the Roti with Black-Eyed Pea Hummus, Eggplant Puree, and Carrot Curry Puree would be a flavorful and colorful snack platter with cocktails. I have to quote a statement about collard greens that I particularly enjoyed: “’Are Collard Greens the New Kale?’ No. Collards have worked harder than kale ever will. Collards are out there digging ditches and roofing houses while kale goes to spin class and leaves early for brunch.” Love that. And, the recipe for Collard Green Salad with Coconut Dressing made with ginger, lime juice, and chipotles sounds fantastic. Another collard greens recipe I want to try is the Collard Green Salsa Verde served with Salt-Crusted Salmon. A perfect example of a melting pot type of dish is the Afro-Asian-American Gumbo. The roux is made with dried shrimp which is also done in Senegal, okra was of course first grown in Africa and brought to North America by slaves, and the rice is added in a South Carolina style. I got completely distracted by the recipe for Tofu Gnocchi with Black Garlic Crema and Scallions since I’d never before encountered tofu gnocchi. The Beer-Battered Long Beans also got my attention. And, the Cocktails chapter continued the book's excitement with a West African Peanut Punch made with a smooth puree of peanuts, bourbon, and chile honey. My first trip to the kitchen with this book was to try the Udon Noodles and West African Peanut Sauce. The inspiration for this dish came from a mix of African and Japanese populations in Brazil. In the book, the dish is made with edamame. I couldn’t help making a local and seasonal adjustment. I had just brought home snow peas from Boggy Creek Farm and opted to use them here instead of edamame. 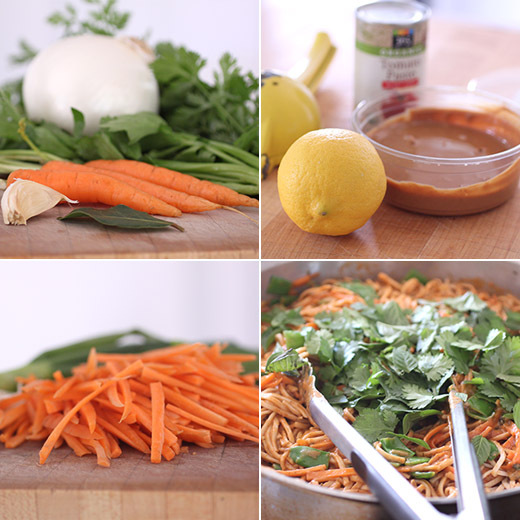 This dish is all about the sauce, and this Mother Africa Peanut Sauce begins with a mirepoix and then some. First, cumin seeds were toasted in olive oil. Then, diced onion, carrots, tomatoes, celery, garlic, bay leaf, cilantro, bird’s eye chile, salt, and lemon juice were added. Next, tomato paste and peanut butter were added followed by vegetable stock. The sauce was stirred well and left to simmer for about 45 minutes. The bay leaf was removed before the sauce was pureed with an immersion blender. 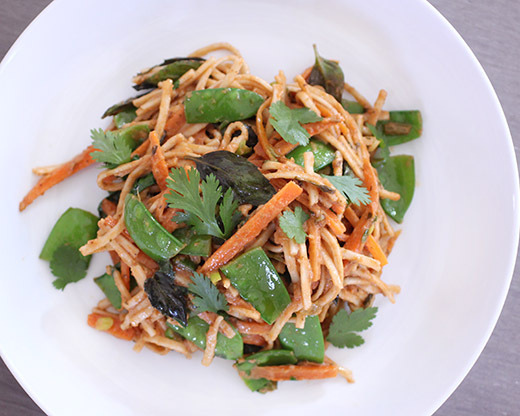 For the noodles, carrots were julienned and stir fried before being added to cooked udon along with chopped green onion and snow peas in my case, cilantro, Thai Basil, and the peanut sauce. There’s a lot of history that accounts for the combinations of flavors in these dishes, but the recipes are fresh and contemporary. There are big flavors, lots of spices and bright herbs, and a generous use of vegetables throughout the book. It’s going to be fun to continue tasting my way through the pages. Excerpted from Between Harlem and Heaven: Afro-Asian-American Cooking for Big Nights, Weeknights, and Every Day by JJ Johnson and Alexander Smalls. Copyright © 2018 by JJ Johnson and Alexander Smalls. Reprinted with permission from Flatiron Books. All rights reserved. Photography by Beatriz da Costa. In Brazil, there is an African population and a Japanese population that live really close together, and both grew up on udon West African peanut sauce is the mother sauce: peanut butter, tomato paste, tomatoes, French mirepoix, and our special mirepoix In the end it’s like a pad thai with more frequent flyer mileage in its account. There’s nothing like eating noodles and pasta when the sauce is really right. West African peanut sauce provides the perfect creamy coating for the Japanese udon noodles. Heat the oil in a wok over medium heat. Stir fry the carrot and the onion for 1 minute. Add the peanut sauce and stir to coat. In an 8-quart pot, bring water to a boil, salt it, and cook the noodles according to the package directions. Drain and add the noodles directly to the peanut sauce mixture, tossing to coat. 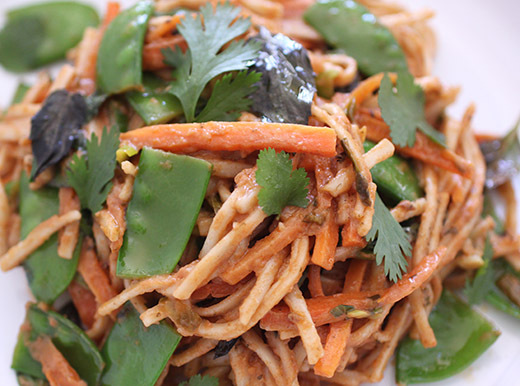 Plate the noodles and top with edamame, cilantro, and Thai basil leaves. Heat the oil in a 4-quart pot over medium heat, add the cumin, and fry for 1 minute, stirring constantly. The cumin will become very aromatic and a few shades darker. Add the onion, carrots, tomato, celery, garlic, bay leaf, cilantro, chile, salt, and lemon juice, stirring to coat the vegetables in the toasted cumin oil. Sauté until the vegetables soften, about 5 minutes. Stir in the tomato paste and cook for 2 minutes. Once the tomato paste is incorporated, add the peanut butter, working it into the vegetables with a little stock, if needed. Cook until the oil separates from the peanut butter, about 5 minutes. Add the stock and stir, making sure to bring up all of the tomato paste and peanut butter from the bottom of the pot so it is well blended. Increase the heat to medium high to bring the sauce to a simmer. Cook, stirring, for 45 minutes. Remove the bay leaf. Using an immersion blender, puree the sauce in the pot until smooth. Season with salt to taste. This looks like a terrific recipe! Healthy, and sounds like it has outstanding flavor. Thanks! i can't seem to get enough peanut butter these days, and i'm loving it in savory applications most of all! delicious dish.